The Cold Stone¨ Ice Cream Parlor Mix contains five delicious flavors inspired by Cold Stone¨ Creamery treats: Chocolate Devotionª, Our Strawberry Blondeª, Birthday Cake Remixª, Apple Pie a la Cold Stone¨ and Mint Mint Chocolate Chocolate Chip¨. 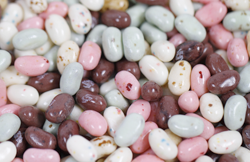 This clear, re-sealable bulk tub with lid contains 16 oz of assorted Ice Cream Parlor Mix jelly beans. Approximately 400 beans per pound.